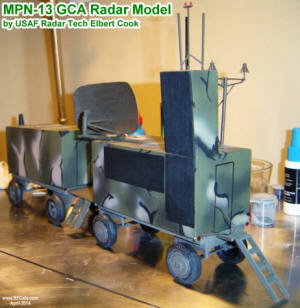 Elbert's MPN-13 Scale Model Is Complete! It has an incredible amount of detail, including the ASR (airport surveillance radar) and PAR (precision approach radar) antennas, the VHF and UHF radio antennas, navigation hazard light, and even the gin poles that stabilize the trailers against wind forces. Elbert's modeling skills are impressive indeed! Hopefully, this model will someday end up in a USAF museum - maybe at Wright-Patterson AFB. 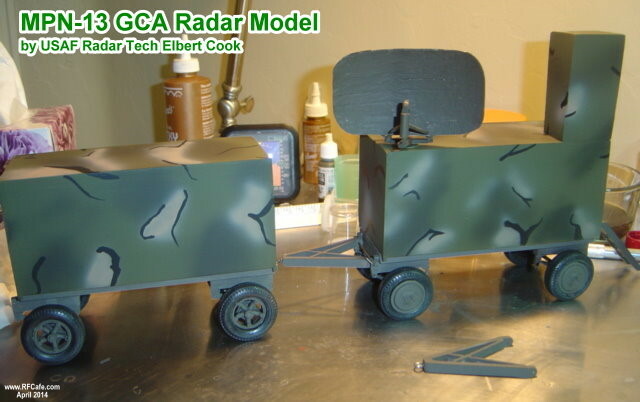 USAF radar technician Elbert Cook worked on a lot of MPN-13 ground controlled approach (GCA) radar units during his career. He knows it inside and out. 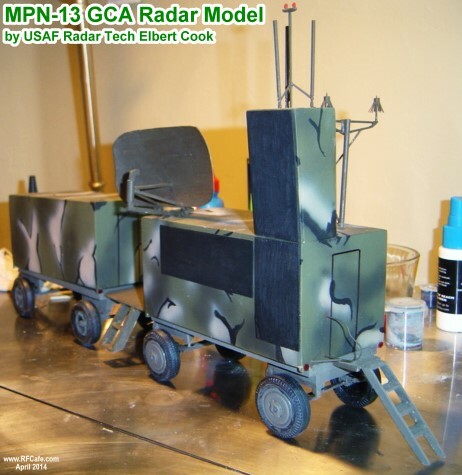 You might think that after retirement Elbert might not want to see an MPN-13 again, but his model building hobby has him working on a scale model. As you can see by these first couple photos, it is just getting under way. Elbert promises to send updates as the MPN-13 progresses. It should be an interesting project to follow. "As near as I can figure the scale is 1:32. 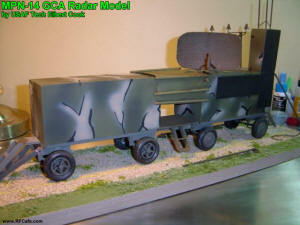 As it stands now there is nowhere else I am posting the pictures. After it is done I will send pictures to Virtual Aerodrome but right now I don't think they would understand what I am doing. I could be wrong. 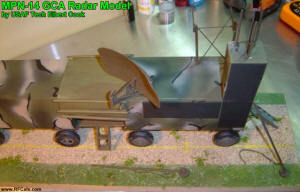 Currently I am working on the ASR Antenna. If I remember right there were two that we used. The 924 and the 1197. Most of the time In the MOB we used the 924 because it had a better low level beam pat and was easier to pass a flight check. ;The 924 was more square, that's the one I am working on. 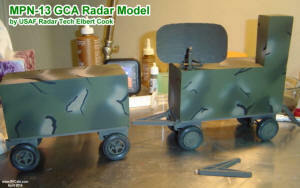 The plan is to checkerboard the radar. I think it will make some of the detail stand out more. We will see." 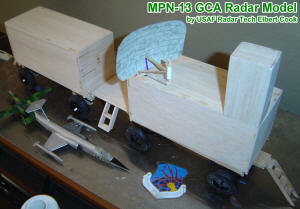 This is an MPN-13 with its separate Maintenance (left) and Operations (right) trailers. April 2014 Update: Elbert submitted photos (see below) of his completed MPN-13 GCA model with a spiffy real-looking camouflage paint job! 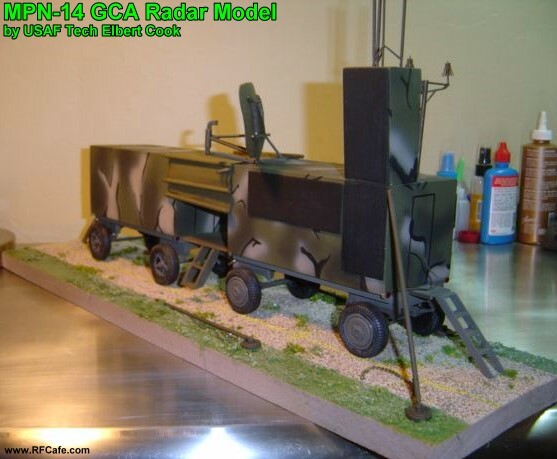 It includes both the maintenance trailer and the operations trailer, complete with airport surveillance radar (ASR) antenna, precision approach Radar (PAR) antennas (azimuth and elevation), VHF and UHF antennas, and navigation hazard lights. The "M" part of "MPN" stands for "mobile." As such, I and hundreds - maybe thousands - of USAF radar technicians have over the decades disassembled, transported, and reassembled these radars many times. My radar shop at Robins AFB, Georgia, participated in what were code-named "Healthy Strikes" two or three times each year, whereby a claxon in the barracks rudely awoke 5th Combat Communications Group (5CCG) members at around 5:00 am to signify the beginning of what would be about a week in the field, simulating an emergency deployment to anywhere in the world. If memory serves me correctly, we had 12 hours to pack, eat dress, out-process, disassemble and pack the radar (the big ASR parabolic antenna and IFF "tootsie roll" antenna got stuffed inside the trailer), gather our maintenance gear, roll up external trailer interconnect cables, hook the trailers to 2-ton trucks, and report to the "ready line" for moving out. We then drove to the local civilian airport, surveyed the site and set up the radar, fired it up and got it checked out and aligned, then performed a qualification procedure with a specially equipped USAF jet that verified the surveillance radar was accurate and that the glide slope and course line were properly aligned for a precision approach. 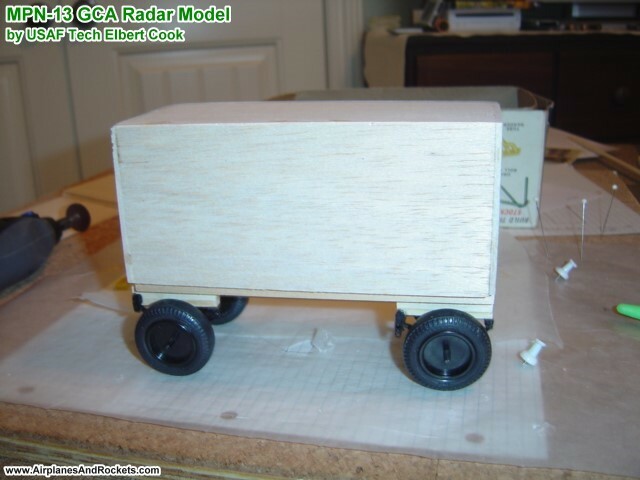 Those were the days before GPS approaches. 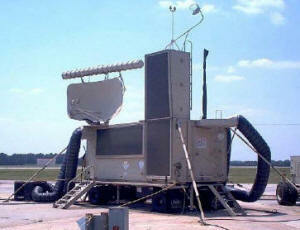 Elbert did the same kind of thing, only for the 3CCG at Tinker AFB in Oklahoma. 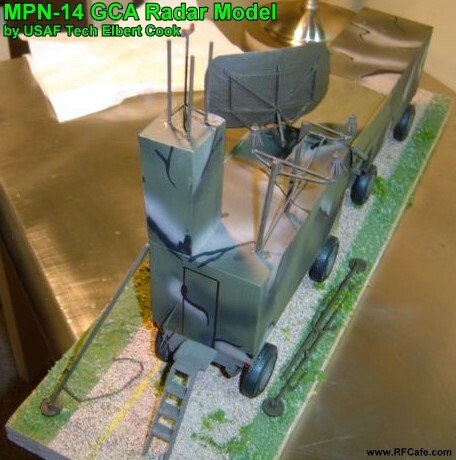 January 2014 Update: Former USAF radar technician Elbert Cook, who last year sent photos of a scale model he was building of the MPN-14 ASR/PAR radar system, has submitted photos of when the 3rd Combat Communication Group (aka 3CCG or 3rd MOB) sent one of its systems to Minot AFB, ND, for a TPX-42 secondary radar system installation. The TPX-42 is the unit that interrogates an aircraft's transponder to paint the familiar 3-digit octal IFF (Identification Friend or Foe) code on the PPI (Plan Position Indicator) display for ATC (Air Traffic Control) use. 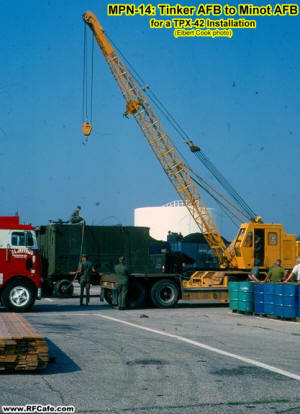 The purpose of the photos is to show how improvisation with a "suitable substitute" lift kit saved the USAF, and in turn the U.S. taxpayers, a lot of money. A boat lift kit was purchased - in lieu of a formal USAF issued lift kit - for use in moving the radar trailers from the lowboy trailers onto the ground. Elbert was kind enough to send these photos from his time at Tinker AFB, Oklahoma. 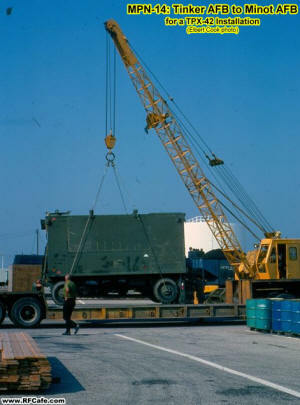 The radar techs procured an inexpensive boat lift kit from an MPN-13 for moving the trailers off a lowboy flatbed. 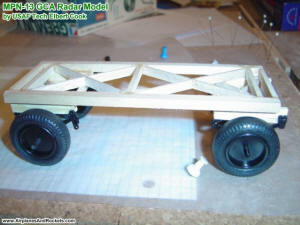 Elbert said, "The boat lift kit we used came with the MPN-13. 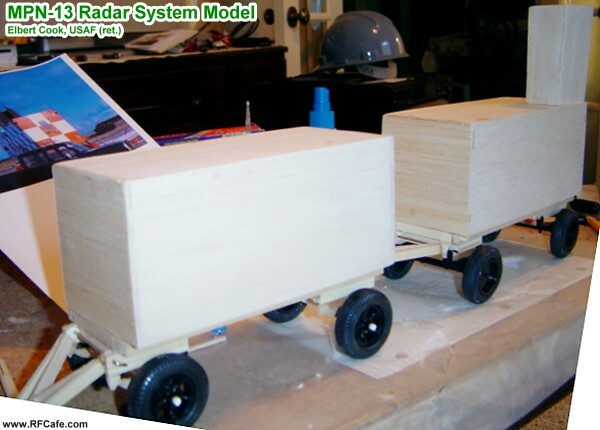 We used it because the moving company wanted to spend a lot of money getting the trailers off the trucks. We had never used one before but we put it together and got the trailers of the trucks quick and save a lot of money and time. " 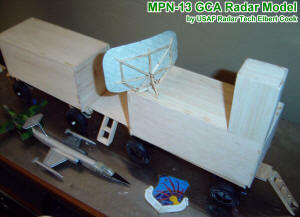 MPN-14 at Minot AFB, ND. 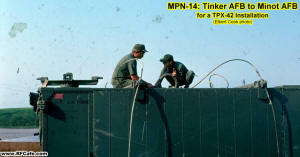 Attaching the boat lift kit to the MPN-14 trailer.